The Asia Foundation was a creation of the CIA, and to this day remains a front for the US State Department and the corporate financier interests of Wall Street and London. Their attempts to overthrow the sovereign institutions of Thailand by backing the regime of Thaksin Shinawatra has required them to conduct extensive research into the population of Thailand in order to find the strengths and weaknesses of both the Thai establishment, and their proxy, the Shinawatra regime. To that end, they have conducted several “national public perception surveys of the Thai electorate,” (2010’s full .pdf here), revealing what must have been for them and their proxies, very unpleasant realities within Thai society. 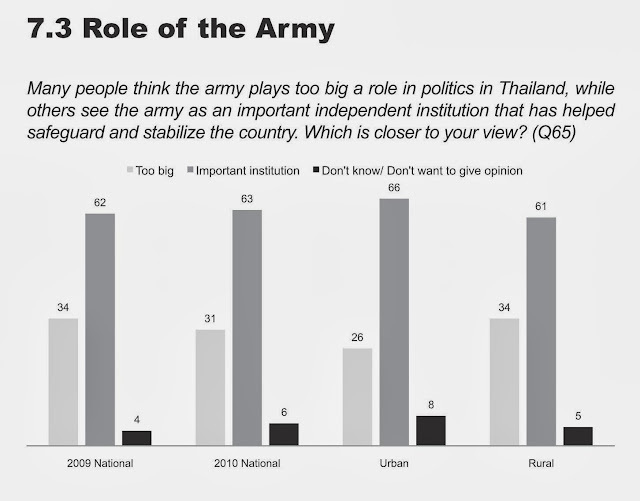 Graph: Up from 62% the year before, the public perception of the military as an important independent institution stood at 63%. Even in in the regime’s rural strongholds, support stood at 61%. The only group that did not support the military, was the regime’s tiny “red” minority, but even amongst them, 30% still supported the army. 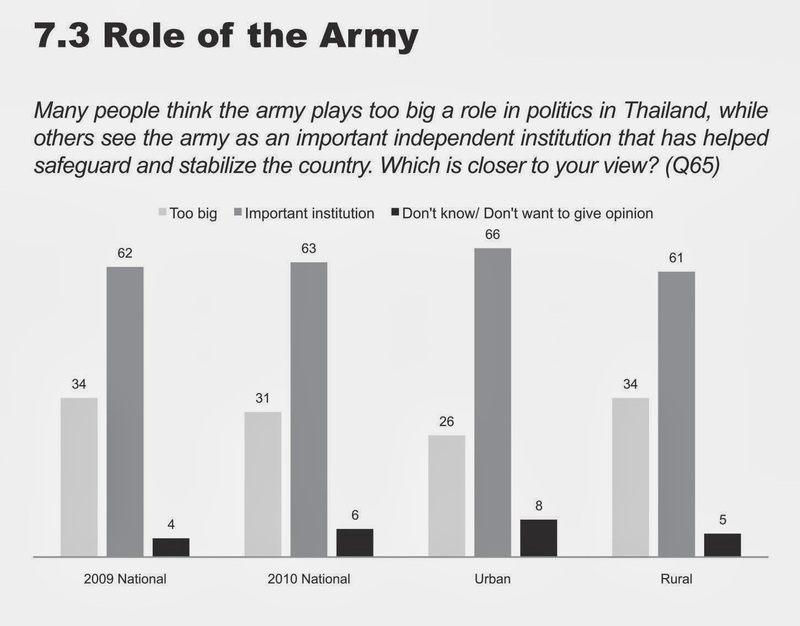 It was revealed that Thais identifying themselves as the regime’s “red” supporters represented a minuscule minority – some 14%, half of which only described themselves as “leaning toward “red.” More importantly, it was revealed that many more Thais (62%) believed the Thai military, who ousted Thaksin Shinawatra from power in 2006 in a bloodless coup, and who put down two pro-Thaksin insurrections in 2009 and 2010, was an important independent institution that has helped safeguard and stabilize the country. While the West and the Shinawatra regime itself attempt to portray the army as widely reviled for its “undemocratic interventions,” the Thai people simply do not see it that way. The West of course, does not honestly believe the Thai Army is “undemocratic” – instead, they understand that it is an independent institution over which they exert very little influence, and that it constitutes the ultimate check-and-balance of last resort, standing between the Kingdom of Thailand and Wall Street’s wholesale pilfering of the nation. Despite years of the West attempting to cultivate close relationships with the Thai military through operations like the annual “Cobra Gold” exercise, Thailand’s brass appears to be cogent enough to value their freedom more than slick promises, funding, and vague enticements the West has made and then broken with so many nations before. Like the Egyptian and even Pakistani armies, they are more than willing to take funding, training, and weapons, and still carry on with an independent agenda. 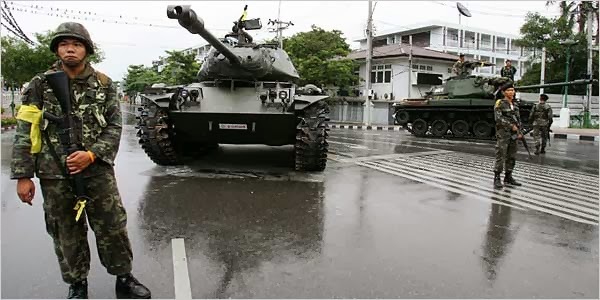 Image: Thailand’s military mobilized in 2006 to oust Wall Street-backed dictator Thaksin Shinawatra, who just the previous evening was sitting before the CFR giving his foreign sponsors a progress report. While the West attempts to portray the Thai military as “undemocratic,” the reality is the Thai army carried out what it was duty-bound to perform – the defense of Thailand against all enemies, foreign and domestic. The hope for the West is eventually establishing a contact somewhere in the upper brass that will take the Pentagon’s “phone call” at a pivotal moment in Thailand’s history. However, the pressure the US has put on the Thai military since 2006’s ousting of US-backed Thaksin Shinawatra, should be evidence enough for senior and junior officers to understand the true nature of the West’s overtures. The final goal for the West is to reduce the military as subordinate to which ever proxy regime they are able to eventually install, curtailing indefinitely the military’s widely respected, unique traditional role in Thai society. The military would then become yet another tentacle of Wall Street’s influence, like in Cambodia where entire units are literally sold out to foreign interests as mercenaries to protect land seized out from under the Cambodian people. In Thailand today, as the West’s embattled proxy regime struggles to stay in power, the Western media is again aiming its rhetoric at the Thai military, attempting to preemptively shame it into standing on the sidelines. Of course, the West’s media has lost significant statue in recent years, and attempts to shame the Thai military into inaction during a pivotal point in Thai history should be perceived both inside and beyond Thailand as negligible at best. 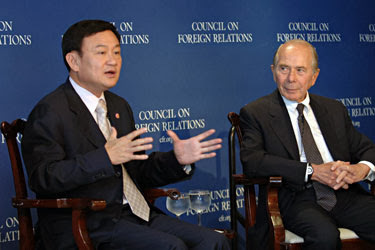 Despite Thailand being run openly by convicted criminal, mass murder, and fugitive Thaksin Shinawatra, who was not elected, not on the ballot, and is not even in the country, the CFR’s piece implies that the current regime is a legitimate “parliamentary democracy,” and that coups are outdated, unnecessary, and undermine the country’s “democracy.” Should the CFR have its way, Thaksin Shinawatra would not only be allowed to continue running the country via his nepotist-appointed sister, current prime minister Yingluck Shinawatra – already a breathtaking display of banana republic-style corruption – but eventually return both to Thailand and to power, to repay the West for the last decade of stalwart support it has provided him. Of course, the CFR in no way speaks for the West, but rather an increasingly exposed and unpopular edifice of Wall Street’s unwarranted influence. Should the Thai military limit any of its actions based on the “noise” coming from these interests and their vastly conflated propaganda, it would truly be a miscalculation. The military of any nation is authorized and in fact duty-bound to guard against all enemies, foreign and domestic. In the case of Wall Street-backed Thaksin Shinawatra, there exists a potent foreign and domestic threat in one regime. It is a threat that must be met, if possible with as little intervention as possible from the military, but with full commitment if necessary. Thailand has set an example by which other nation’s armed forces should follow. The imaginary line drawn between unhinged corruption and inevitable national tragedy, and the military being able to intervene is just that, imaginary. Officers with courage and commitment to the future of their nation rather than what padding is promised for their pockets can, and do, easily cross that line.Thailand has yet to make that mistake. It would be truly tragic if the rhetoric filling unread columns written by the CFR and other corporate media outlets, was the reason Thailand finally did make that mistake.